- Rider Lock and Seal Lunch Box with small lock n seal box. - Capacity- 850 ml + 200 ml. Specifications: Material: Food grade plastic . Type: Portable .Capacity of Rice Box: 600ml . 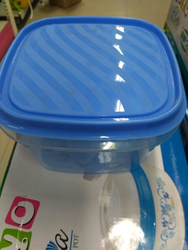 Capacity of Food Box: 450ml .Weight: 830.0g . Color: Color May Vary.